In my discussion of The Duchess I talked about the Regency Crisis, but it’s worth going over again. The British Government of the period was conceived of as The Crown in Parliament, meaning that the King ran the government, but that Parliament played a dominant role in the legislative process, so that the king had to operate through his ministers in Parliament rather than just issuing decrees on his own. Thus the king was a vitally important figure, unlike in modern England, where the monarch mostly plays a ceremonial role. The king had considerable control over which ministers served in government, he controlled appointments to many lucrative positions in government and within the royal household, and he had to assent to the laws passed by Parliament in order for them to take effect. English politics was divided into two broad political parties, the Tories and the Whigs. The Tories favored a strong monarchy that operated by its own rights, as well as a traditional Anglicanism that included privileged political status for Anglicans and a degree of hostility toward Catholics. The Whigs favored a weaker monarchy that operated within limits set by Parliament, significant political reforms to what they saw as a corrupt political system, and toleration of religious minorities, including political rights for Catholics. Although they were generally opposed to the king’s power, only a minority of them were Republicans. The Whigs had been in political ascendency for much of the early 18th century, but when George III came to the throne, he quickly threw his political support to the Tories, which pushed the Whigs out of power and fractured them into several factions based around different politicians. George was a loving husband and father, but very strict and pious. He expected his children to be disciplined and virtuous, and he grew increasingly disappointed with his oldest son, George Prince of Wales, as he reached adulthood and proved to be a rather dissolute young man. Prince George favored a lavish lifestyle (later on as king, he was an important patron of art, architecture, and fashion), and indulged in heavy drinking, excessive gambling, and wild parties, and so he quickly fell deeply into debt, despite the very substantial income he received from both his father and Parliament. The Prince’s behavior disgusted the King, who was very critical of his son’s ways and refused to pay his debts. The Prince, for his part, felt his father was excessively strict and was frustrated by the King’s failure to give him any significant duties. The father-son hostility that developed between the two men was a replay of the conflicts between previous generations; George I had disliked George II, and George II and his wife had loathed their son Frederick, being somewhat relieved when he died young, leaving the future George III as his heir. The Prince’s quarrels with his father meant that he supported the Whigs, many of whom clustered around the Prince as the inevitable future ruler of the kingdom. When, in the fall of 1788 it was realized that George III was mentally incompetent, the initial assumption was that he was about to die, and thus the Prince would become king soon. But after a few weeks it became clear that the king was not physically in decline and a messier problem emerged, which historians call the Regency Crisis. The British system required a monarch who could actually perform his duties, and so it was necessary for Parliament to appoint a regent, who realistically would have to be Prince George. But the question was on what terms would he become regent? The question had political as well as constitutional significance. 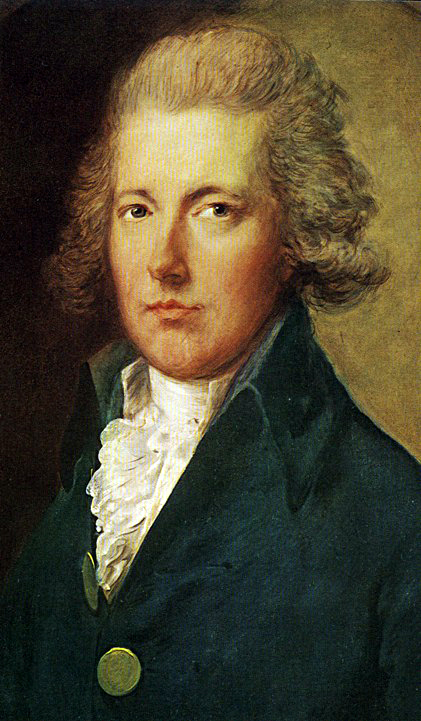 Since the Prince clearly favored the Whigs, he could be expected to demand the resignation of the Prime Minister, William Pitt the Younger (so named to distinguish him from his father, who had previously served as Prime Minister as well, but also a nod to the fact that he was the youngest man ever to serve as Prime Minister, an office he took over at 24). Pitt governed by a decent majority in Parliament, but his position was dependent on the Whigs being disunited and on the support of the king. If Prince George took over as regent, he could be expected to offer the Prime Ministry to Charles James Fox, one of the leading Whig politicians. The Whigs hoped that the Prince would appoint them to lucrative government offices and support their desires for political and legal reforms. So the Whigs dearly wanted the Prince to receive a strong regency, while the Tories wanted him to receive a limited regency. This led to a bizarre inversion of the normal Tory and Whig positions. The Whigs who normally championed the power of Parliament to limit the Crown suddenly began insisting that the Prince automatically had full authority by his own rights, while the Tories, who normally championed royal rights argued that Parliament had the power to dictate the terms on which Parliament granted the regency. The Whig position was that George III would not recover his wits and was therefore functionally dead; so the Prince was legally king in all but name already and therefore deserved all the powers the king enjoyed. In contrast, Pitt asserted that the king was only temporarily indisposed and would recover, so Parliament had the legal right to decide which royal powers would be delegated to the Prince of Wales. 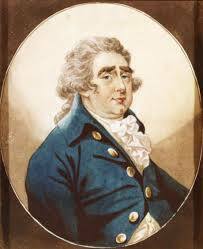 A key figure in this was Edward Thurlow, the Lord Chancellor. This was a key office in government; the Chancellor acted as the presiding officer in the House of Lords, the controller of the Great Seal, and the leader of the Supreme Court of England and Wales. Thurlow was a Tory, but he disliked Pitt, and so the Whigs hatched a plan to win his support for their cause by promising that he would continue as Lord Chancellor during the Regency, an offer that Thurlow appeared receptive to. His defection from the Tory cause could well have fatally undermined Pitt’s position. Fortunately for Pitt, the Whigs proved incapable of taking effective advantage of their window of opportunity. By coincidence, Fox was in Italy when the Regency Crisis broke out, and when he finally returned, he was slowed by illness. This bought time for one of his allies, Richard Brinsley Sheridan, to insinuate himself with the Prince of Wales and shape the Prince’s ideas of what he would do; ultimately this meant that Fox had little control over the Whig strategy, despite being its most prominent leader in the House of Commons. Sheridan disliked Charles Grey, another of the leading Whigs, and persuaded the Prince to promise Grey an insultingly minor office, which alienated Grey. The political philosopher Edmund Burke, an important Whip MP, initially supported Fox, but later on became disgusted by his willingness to compromise on principles and alienated many other Whigs. Behind th scenes, Georgiana, the Duchess of Devonshire, struggled to organize her party but was unable to get them to overlook their personal rivalries and disputes. When Fox finally appeared in Parliament, he gave a very ill-advised speech in which he declared that Parliament had no right to impose limits on the regency. Pitt immediately attacked this as contradicting nearly a century of political practice. This proved the critical turning point in the Crisis, because after these speeches, it was clear that Pitt had gotten the upper hand and Parliament would dictate the terms of the regency. Soon after, Pitt persuaded Thurlow to continue supporting him. Throughout this whole affair, the Prince of Wales had been a central figure, but he handled the situation increasingly poorly. Initially he had shown a great deal of concern for his father’s well-being, weeping so much his doctors decided that he needed to be bled to restore his emotional balance. But as Whig politicians like Sheridan and Grey courted him, the Prince, who had almost no real experience with politics, let the attention go to his head and became impatient to receive what he felt were his legal rights. Despite Sheridan’s advice, he began staying out late, drinking and gambling scandalously. At one card game, he announced, “I will play the fool”, when he threw down one of the kings. One evening, he drove his carriage through the city so wildly that he broke several street lamps. These actions helped increase public support for the King, who was already quite popular, and made it harder for the Whigs to demand the Prince’s rights. Pitt wisely recognized that he needed to play for time, so he stretched out the negotiations for the Regency Bill. The Bill would have granted the Prince a very limited regency, according him a veto over the making of peers and the granting of life-time offices, and awarding complete control over the king, the royal family, the king’s property, and the offices of the royal household not to the Prince but to Queen Charlotte, who firmly supported Pitt. The Prince protested that denying him control over his father was an insult to his character, since it implied that he could not be trusted with the king’s life and health. The Whigs fought the Bill the whole way, thus foolishly playing into Pitt’s strategy of delay when it was clear that Pitt had a solid majority that the Whigs could not hope to overcome. Then, on February 20th, a few days before the Bill would have been presented to the House of Lords and been passed, it was abandoned. The King had recovered from his illness and the Regency Crisis had passed. The film presents the Regency Crisis somewhat differently. 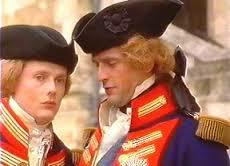 It establishes early on that the King (Nigel Hawthorne) and the Prince of Wales (Rupert Everett) dislike each other. The King calls his son “The Fat One” (a somewhat unfair charge, since the Prince only became corpulent in later life), and the Prince ridicules his father. At one point he tells his mother that he would have thought she would be glad to take a break from bearing so many children. She accuses him of laziness, to which he retorts that he is given nothing to do. The film presents Prince George as the central villain of the film. He loathes his father for what seem like minor reasons, and he schemes to push his father into a public breakdown so that he can become Regent. The film downplays his father’s physical assault on him to make it less serious, and it assumes that the Prince’s shows of concern for his father are an act rather than a genuine expression of filial concern. While it is not impossible that the Prince’s public concern was faked, it seems more likely that his initial concern was genuine but the political situation wore down his somewhat weak character. The film also shows the Prince taking control of the king’s person and using that to isolate him from the queen, who is denied access to her husband until finally one of her attendants, Lady Pembroke (Amanda Donohoe), seduces the king’s equerry, Greville (Rupert Graves), so that the queen can get last minute access to the king to warn him of the impending regency bill. The film suggests that the king’s separation from his wife was emotionally traumatic and harmful to him. The Prince gives his physician, Dr. Warren, control of the king’s treatment, with the understanding that it is Warren’s best interests if the king doesn’t recover. In reality, the situation was the opposite. Throughout the Crisis, Pitt and the queen controlled access to the king. It was the Prince who was denied access during the illness, except for one brief meeting rather late in the crisis. It was the queen who arranged for Dr. Willis to treat the king. So the film is clearly demonizing the Prince as a way to increase the tension in the film. The Parliamentary situation is also mis-represented. Pitt, Fox, and Thurlow are shown as the key figures in Parliament; Sheridan, Grey, and Burke are entirely absent from the film, and Fox is shown as being in London throughout the whole process. That’s a minor detail, but a more serious problem is the film’s depiction of the Whigs as being largely unified, plotting effectively, and gradually increasing the pressure on Pitt by winning Thurlow over to their cause. The Regency Bill is fundamentally misrepresented. The film presents the political debate as revolving around whether or not there will be a Regency at all; Fox and the Prince are pushing for a Regency, and Pitt is fighting a slowly losing battle against one. Initially he wins a vote on Regency by 30 votes, but later on Fox wins a vote to demand a Regency Bill by 3 votes. At this point, the desperate Queen Charlotte (Helen Mirren) hurries to Kew and gets access to George, warning him that he is about to be pushed aside by his son. The king recovers and Thurlow, having seen that the king is well, changes sides and frantically races back to London as Parliament debates the Regency Bill. He hurriedly tells Pitt that the King has recovered, and Parliament abruptly ends its debate (during a speech by a member of Parliament played by Alan Bennett) and rushes outside in time to see George getting out of a carriage, obviously well. The Prince signifies his defeat by fainting. The film’s vision of the Regency Bill is that it would have inaugurated a permanent shift in government. 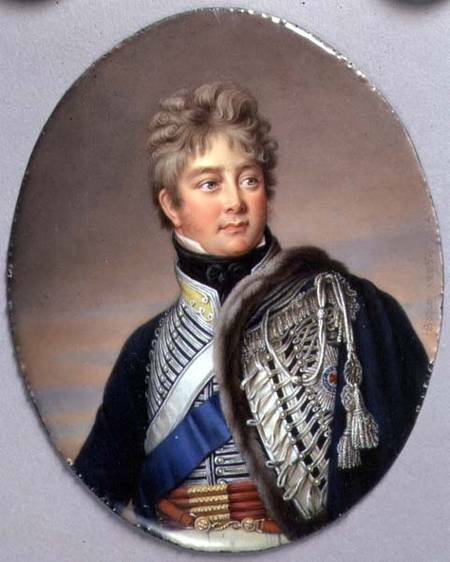 It would have perpetuated Prince George’s control over the king’s person, which would have enabled the Prince to keep the King locked up in perpetuity, thus effectively making the Prince Regent a functional king. This is false; the Regency Bill would have had effect only as long as the King was incapable of fulfilling his duties, and the regency would have ended as soon as the King was well again. 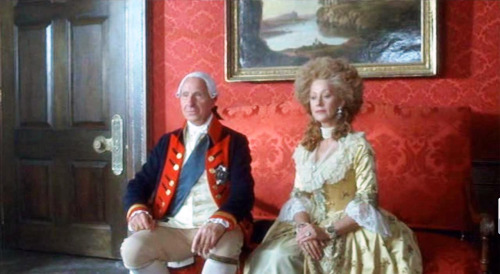 The film suggests that the Regency Bill represented everything the Whigs wanted, when in fact the Bill represented exactly what they didn’t want. The film offers no suggestion that Pitt has any alternative to a full regency and that he was on the losing side in the debate. The actual political issues are presented wrong. 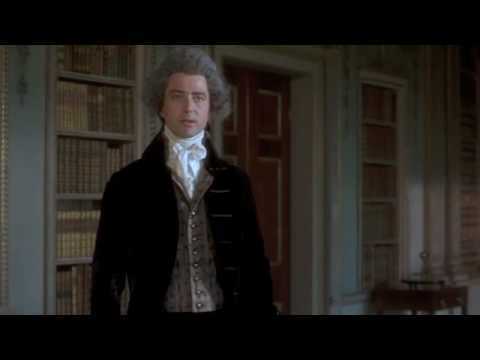 And, in true cinematic fashion, the defeat of the Regency Bill is a matter of high drama and a narrowly-timed victory that would have failed if a flock of sheep had taken more time to get out of the way of Thurlow’s carriage. So while the very basic scenario of the Regency Crisis is true (the King’s illness had political ramifications, the Whigs and the Prince schemed to get the Regency, a Regency Bill was presented to Parliament for a vote), almost all the details are wrong and the historical situation is almost entirely inverted; early in the Crisis, the Whigs and the Prince lost their opportunity to get what they wanted, largely through Fox’ disastrous speech, and Pitt had the upper hand from that point on. If the film has a deeper message, it is about political cynicism. The Prince and Fox have no political principles whatsoever beyond a lust for power. Lady Pembroke seduces Greville not because she is actually attracted to him but because it is the only way to get the queen in to see the king; when Greville later makes an advance on her, she shoots him down. When the king haltingly apologizes for his inappropriate behavior toward Pembroke, Pembroke offers the polite lie that she has no memory of anything inappropriate and that his behavior was always proper. Throughout the crisis Greville has been loyal and supportive to the king, while another equerry, Fitzroy, has betrayed the king by passing information to the Whigs. At the end of the film, Greville is ordered to fire the king’s loyal attendants, and then he himself is dismissed, while Fitzroy is promoted. This is untrue; Greville remained in service as an equerry until 1797; after his dismissal, he was eventually promoted to the more prestigious position of Groom of the Bedchamber. The message here that kings have no loyalty to those who see their weaknesses, while treachery like Fitzroy’s can get one advancement. This all fits in with the film’s rather negative view of court protocol. The film emphasizes a variety of what to modern eyes are rather bizarre and nonsensical rules. People are not supposed to look directly at the King, and even his personal physician is not allowed to ask questions directly to the king or examine his body. People sit only when the King grants permission for them to, and he rarely does. During one scene, the King and Queen sit to listen to a concert, while the rest of the court struggles to keep standing. The King denies a pregnant woman the right to sit down, and the court quietly groans when George declares he wants to hear the concert a second time. When the king and queen leave, the whole court immediately collapses into every available seat. These rules are presented as part of the cause of George’s problems, and what he needs a dose of being treated like everyone else, being forcibly restrained until he can learn to control himself again. So the re-establishment of these protocols when the King apologizes to Lady Pembroke and she lies to him signals a return to a morally corrosive situation. What the film doesn’t want to admit is that its criticism of the Crown has a lot in common with the Whigs’ opposition to the Crown. The Whigs generally championed the power of Parliament over the hereditary rights of the king, and felt that the system of patronage that the Crown used to win support was legalized corruption, and they wanted to restrict it. Fox was an advocate for the abolition of slavery and the establishment of religious toleration. Fox’ branch of the Whigs gradually laid the foundation for the reform-minded Liberal Party of the 19th Century. In 1832, Charles Grey was finally able to introduce a Reform Bill that dramatically expanded the voting franchise, abolished rotten boroughs (which were essentially the private ownership of a seat in the House of Commons), and generally restricted legal opportunities for bribery. So while the film quietly ridicules the system that the Tories supported and the Whigs opposed, it makes the Whigs the bad guys by simply never explaining what the deeper political issues of the day were. Obviously explaining 200-year-old political debates to an audience that no longer sees the relevance of the issues is a tough act, and it’s easy to understand why Bennett chose to simplify the political issues. 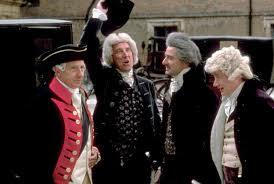 King George is his hero, and that makes the decision to cast the Prince and the Whigs as the bad guys rather obvious. The real problem is Bennett’s decision to moralize the king’s illness and emphasize it by showing the monarchy as governed by corrupt protocols, because not only is it false to the facts of the time, but it also undermines the film’s point that the king’s illness wasn’t psychological but rather metabolic. The film’s triumphant return of the King to mental health and political power is undermined by the emphasis on the resumption of court protocols that were supposedly responsible for the king’s illness in the first place. A Royal Affair is about George’s sister Carolina Matilda, who became Queen of Denmark. The Madness of King George is available on Amazon. 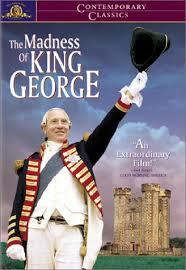 The screenplay, The Madness of King George, is also available. If you want something on the Regency Crisis, you don’t have a lot of options. John Derry’s The Regency Crisis and the Whigs 1788-9 is about half a century old, but still a good study of the fracturing of the Whig Party. E.A. Smith’s George IV (The English Monarchs Series) seeks to rehabilitate the reputation of this poorly-regarded king. I found his brief section on the Regency Crisis to be quite helpful in writing this post. Finally, you might take a look at Amanda Foreman’s Georgiana – Duchess Of Devonshire (available in paperback and Kindle edition). She examines the duchess’ behind the scenes role in the Crisis quite nicely.